We’d love your help. Let us know what’s wrong with this preview of Men and Women in the Church by Sarah Sumner. To ask other readers questions about Men and Women in the Church, please sign up. As you head into it, be aware that Sumner's structure struggles, as she really should have made larger chapters or divided the book into further parts. Most chapters add to the argument in the next chapter, giving the impression that all chapter are interlinked. But she does this for a reason, showing how one argument is connected to another, which finds it's roots in another. Perhaps her book structural mirror how convoluted the arguments surrounding marriage are (but I doubt that was intentional). While Sumner spends much of her time defining terms, she gives a poor definition of "feminism" as it's used today. I would have preferred that she spent more time clarifying the different types of feminists, because she makes universal claims about feminism that aren't correct (anymore). And though she presents each view on marriage's view in a comprehensive and loving way, she doesn't always state where she stands, waiting until the end to give a complete summary of her views. Overall, I adored this book and suggest that anyone interested in the issue of men and women's function in the church read it. Like most issue, not a single person is truly 100% complentarian or egalitarian, so everyone can learn something new from this book. An important read for all Christians regarding women. An academic and heady book originally stemming from her dissertation, it took me three years to digest the analyses in the tiny printed, meaty pages. Solely interpreting Scripture as a basis for addressing contemporary issues about women in their marriages and in church leadership, Sumner humbly and compassionately analyzes both sides of the conplementarian/egalitarian issue and seeks to build consensus among all. Beyond excellent book! I felt as if she took all of the ideas out of my own head and put them on paper! If you ever want to know what I think about the issues of women in the church - here you go! Excellent book. Very very balanced and well-written. I found it very freeing. A breath of fresh air. “Christians don’t have to be feminists in order to believe in social justice. Feminism is not something that must be added to Christianity in order for the church to honor women. The gospel itself is pro-women.” So argues Sarah Sumner in her thoughtful, humble, and deeply personal book Men and Women in the Church. With gentle questions and painstaking logic, she explores the identity of women and men as biblically defined, refusing to adhere simplistically to either side of the “complementarian “Christians don’t have to be feminists in order to believe in social justice. Feminism is not something that must be added to Christianity in order for the church to honor women. The gospel itself is pro-women.” So argues Sarah Sumner in her thoughtful, humble, and deeply personal book Men and Women in the Church. With gentle questions and painstaking logic, she explores the identity of women and men as biblically defined, refusing to adhere simplistically to either side of the “complementarian vs. egalitarian” debate. As I read, I harbored a growing irritation that surprised me. I felt betrayed by my own tradition in a new and unsettling way. Early in the book, Sarah quotes many church fathers who shamelessly belittled women’s usefulness and dignity. While they did this with good intentions, and probably honored women more than the world in which they were writing did, I am still startled at some of their statements. Augustine writes that “not the woman but the man is the image of God,” and that while a man on his own may be the image of God, a woman cannot be the image of God, unless she is joined to her husband. Tertullian writes these harsh words to his sisters: “And do you not know that you are an Eve?... You are the devil’s gateway: you are the unsealer of that tree: you are the first deserter of the divine law: you are she who persuaded him whom the devil was not valiant enough to attack… On account of your desert—that is, death—even the Son of God had to die.” Sumner also writes that Aquinas had little context to see women as useful; he even says that a “father should be loved more than the mother… the father is principle in a more excellent way than the mother, because he is the active principle, while the mother is a passive and material principle.” Yikes! These patristic quotes all sound preposterous to me as a modern, educated woman. As an Anglican who sits under the preaching of a woman every month or two, along with the teaching of women at Moody Bible Institute, these thoughts of women’s uselessness to the church body or ontological inferiority are ridiculous to me. But the way their practical implications have shaped my upbringing and self-image is hard to ignore. The idea that a woman’s place is the home—and that her highest calling is to be a beautiful wife, nurturing mother and cheerful housekeeper—is not foreign to me. In response to all this, Sarah adamantly urges her readers not to “absorb [the church fathers’] bias,” and to recognize that traditional teaching and biblical teaching are not always synonymous. 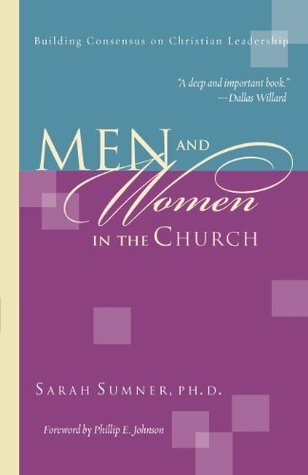 Sarah compares the traditional view of women (that which has prevailed through much of history, within and outside the church) with complementarianism; the first suggests that “women as inferiors [in relation to men] should always assume subordinate roles,” while the second claims that “women as equals [to men] should always assume subordinate roles.” It is this second mindset that has been more toxic in my upbringing. Especially in high school, I eagerly devoured literature on the topic of women’s roles as wife and mother, and I eagerly embraced complementarian ideals—despite the reality that even within my home, my mother took roles of leadership and authority that I often considered inappropriate. I believe now that the reason I did this was partially from desire to follow as closely as possible God’s ideal. But I also desired that I would be the kind of woman that a strong, dominant man would be happy to invite into his mission. Looking into muddled visions of the future, I saw no role for myself beyond that which would be given to me as I attached myself to a man. He would do the dreaming, I would do the helping, and smart, cute kids would follow. While it has been enlivening to read Sarah’s book (and learn what women are not only capable of or permitted to do, but actually gifted, called, and designed to do), I find myself more often frightened and overwhelmed than empowered. It’s one thing to be a strong-willed, “driven” woman finding a hole in the fence; it’s another thing to feel intimidated by my call, paralyzed by my freedom, inundated with options, while also feeling the discrepancy between the world open to me and the limited roles modeled for me as a child and adolescent. The book has many strengths. I appreciated how logically Sarah laid out her argument; she included many personal stories and emotional elements that strengthened her argument, but avoided manipulating readers. Logic and submission to Scripture are the guiding principles in this book. One weakness of the book is the length spent on certain arguments. I appreciated Sarah’s conversation on the meaning of headship, but I think she dragged out her argument (over 50 pages of the book) longer than necessary. Confession: within the first 4 chapters, I had come so close to throwing this book across the room. Although I am glad I finished it,I can't say I can recommend it. Dr. Sarah Sumner, professor of systematic theology, graduated from Trinity, felt that God was calling her to write about men and women in the church, advocating for a third way beyond complementarianism (I.e., the belief that men and women are separate but that women are to submit to men) and egalitarianism (I.e, the belief that men Confession: within the first 4 chapters, I had come so close to throwing this book across the room. Although I am glad I finished it,I can't say I can recommend it. Dr. Sarah Sumner, professor of systematic theology, graduated from Trinity, felt that God was calling her to write about men and women in the church, advocating for a third way beyond complementarianism (I.e., the belief that men and women are separate but that women are to submit to men) and egalitarianism (I.e, the belief that men and women are separate but equal in gifting, and both submit to God). Her third way criticizes both egalitarians as "radical or biblical feminists" or, "women's libber" but also doesn't let specific kinds of complementarity like Wayne Grudem or John Piper get away with everything they espouse to in their Biblical Manhood and Womanhood book. For the first half of the book, she admitted she didn't understand why so many Christian women felt like men were limiting them in the church. But God was showing her differently, which was helping her understand why women felt undermined. It could be because she felt herself to be the exception, a "Priscilla" to preach to men, since Dr. Carl F.H. Henry himself told her it was okay! Oh lord. Sarah Sumner writes with passion and grace as she pleas for a middle road between complementarian and egalitarian gender ideas in the evangelical church. Interspersed with many personal anecdotes, Sumner thinks the likes of Wayne Grudem and Rebecca Merrill Groothuis have it all wrong, and that in a conversation where no one is listening to one another, a lot of the what the Bible is saying is being ignored. While I am not sure what to think of her mysterion interpretation of "headship" or her re Sarah Sumner writes with passion and grace as she pleas for a middle road between complementarian and egalitarian gender ideas in the evangelical church. Interspersed with many personal anecdotes, Sumner thinks the likes of Wayne Grudem and Rebecca Merrill Groothuis have it all wrong, and that in a conversation where no one is listening to one another, a lot of the what the Bible is saying is being ignored. Above was my review on first finding this book and reading about 1/2. I gradually lost steam as it is a bit long and dense. Maybe I still need to write a book that's short, to the point, and easier. Phewy. Dr. Sumner is a conservative, Christian theologian, head of department at a conservative Christian college(Azusa Pacific University) who happens to be a woman. She addresses scriptures pertaining to Christian leadership and applies them to families and the church. Her common sense interpretation is clear, obvious, and never before addressed to my knowlege. If widely read, I believe this little book could set the church on its head (in a good way). Unfortunately, i fear, it will slip into obscurit Dr. Sumner is a conservative, Christian theologian, head of department at a conservative Christian college(Azusa Pacific University) who happens to be a woman. She addresses scriptures pertaining to Christian leadership and applies them to families and the church. Her common sense interpretation is clear, obvious, and never before addressed to my knowlege. If widely read, I believe this little book could set the church on its head (in a good way). Unfortunately, i fear, it will slip into obscurity. Literally the best book I have ever read on gender. I highly, highly recommend it. So well-reasoned and thoughtful and impassioned and balanced. The author manages to speak to all sides of the debate in a liberating and convicting way. - how have I, a woman, been sexist towards other women and even to myself? How do I deal with that? - is saying that men and women are equal "before God" a cop out? Does it free us from any obligation to work out and fi Literally the best book I have ever read on gender. I highly, highly recommend it. So well-reasoned and thoughtful and impassioned and balanced. The author manages to speak to all sides of the debate in a liberating and convicting way. Recommends it for: Every Christian ever. I can't say enough about this book. I just can't. It's freaking amazing, biblically based, and isn't angry. Mrs. Sumner is speaking to both sides of this debate with respect and has something new to say for everyone. Read this book prayerfully, with an open heart and mind. Conservatives, DO NOT BE AFRAID OF THIS BOOK. It's not written by a "crazy liberal feminist" wanting to take over the world. Everyone in the church needs to read this book. I would have given this book 3.5 stars, but since that's not an option four seems fairer than three. Sumner does a good job of fairly representing the views of complementarians (and, for the most part, egalitarians, although she has some animosity toward feminism and doesn't seem to realize that it's such a wide tent that she qualifies). I wish this book were a tiny bit better edited, but overall I found it an incredibly beautiful work. I so appreciate that she approaches the topic from a genuine desire to see everyone serving God, as opposed to treating the issue like some kind of war. I would recommend this book to pretty much anyone. Okay, seriously phenomenally challenging book. Any church leader worth their salt should read this book and discuss it with the other leaders in their context and other leaders in different contexts. I'm available for discussion, too! This book was really important to me. It gave me the theology to back up what I always suspected was true: there is nothing Christian about misogyny. I have already bought two copies for other people. I strongly desire that everyone I have ever known and will ever know read this book. Best book I have read on the theology and relationship of women in leadership in the church. Handled with tremendous grace. Sumner is an excellent scholar and the first woman to graduate with a Ph.D. in theology from the conservative Trinity Evangelical Divinity School. I read and talked through this book with my IVCF staff worker in college and found it extremely helpful in understanding the Biblical texts used to speak to women's roles in ministry. I think it's probably time for a reread to refresh my memory on this great book. Awesome but a lot to digest. recommended and given to me by kelly...apparently the best book on the topic of men and women's roles in the church. i'm looking forward to reading it. One of the best, clearestvand most fair takes on the issue. This book revolutionized the way I think about women in general and especially with regards to the church. A must read for understanding and appreciating the dynamic between men and women. Didn't agree with absolutely everything, but this has some really good concepts to wrestle through (for men AND women).